There’s a common saying: you can’t make an omelet without breaking some eggs. The same principle is applicable whenever a super villain enacts their master plan, especially for X-Men: Apocalypse’s eponymous antagonist. Remaking the world is a messy business, and while he’s certainly powerful in his own right, Apocalypse leaned on Magneto, one of his Four Horsemen, to tear down everything humanity had built in the movie. However, director Bryan Singer wasn’t keen on showing the Master of Magnetism killing innocents while doing it. We tried to keep it that the things that [Magneto] was destroying felt almost more like monuments or rooftops of buildings rather than a building toppling over and people dying. It’s one of the things that Bryan’s very sensitive to. I may be less sensitive to it. Actually, I’m sort of more of a genre geek where I’m okay if cities are destroyed. Bryan’s very sensitive to collateral damage. If you go back and watch the movie, it’s things like bridges ripping apart and cars floating up in the air, but you don’t see cars dive-bombing into the water. Shipping containers flying through the air, but they don’t smash into any bodies. The top of the Sydney Opera House ripping off, but the base of it remaining intact. We tried to be careful about that collateral damage. It’s something people are very critical about in other movies that we know about. Keep in mind that just because the movie didn’t show people dying while Magneto was pulling on the Earth’s magnetic poles doesn’t mean no one perished. Remember, Magneto had given up on humanity at this point, so it’s not like he was shy about taking people out while fulfilling Apocalypse’s wishes. Still, collateral damage is one of those things that’s usually implied when there are huge attacks in superhero movies, so it’s not like moviegoers needed to see it just to understand it was happening. Other superhero movies universes have taken their own unique approaches to handling collateral damage. 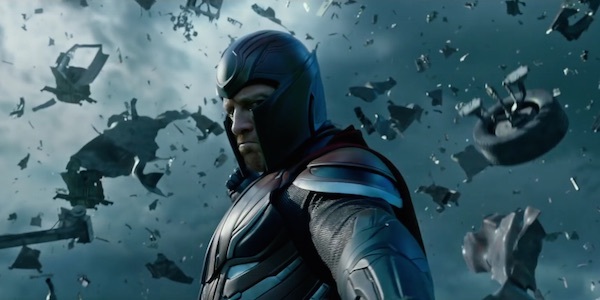 The Marvel Cinematic Universe usually goes a similar direction as X-Men: Apocalypse and focuses on property damage rather than citizens dying in the process. It wasn’t until Captain America: Civil War that we learned the casualties from the attacks in New York City, Washington D.C. and Sokovia, and even then the total number was surprisingly low. Then there’s the DC Extended Universe, which didn’t shy away from innocents being killed during Zod’s attack on Metropolis in Man of Steel and the opening of Batman v Superman: Dawn of Justice. Since the upcoming X-Men spinoffs are in the hands of other directors, one wonders if they won’t tiptoe around innocent lives being lost should there be another battle that massive in scale. You can see X-Men: Apocalypse in theaters now, and click here to read our review of it.